The eye stretches to the horizon and then must continue up. you only see the sky. Fluffy clouds. the roar of the freeway, the roar of the city sheening across the city. There should be a place. At the rest stop, in the restaurant, the overpass, the water’s edge . . .
You wonder what he’s thinking when he shivers like that. the way the song goes. by the side of the road. You keep singing along to that song I hate. Stop singing. 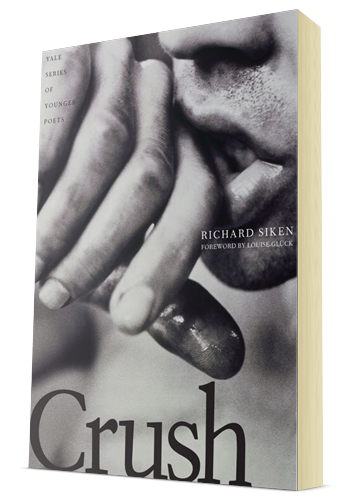 Crush won the Yale Series of Younger Poets Competition in 2004 and was a finalist for the 2005 Award in Poetry given by the National Book Critics Circle.